The Savannah River Site provides for the safe receipt and interim storage of irradiated spent nuclear fuel (SNF) assemblies from domestic and foreign test and research reactors. The fuel is stored in underwater facilities until it is stabilized for final disposition. SRS’s spent nuclear fuel is managed under various National Environmental Policy Act documents, including the SNF Programmatic Environmental Impact Statement, the Foreign Research Reactor Environmental Impact Statement, the Interim Management of Nuclear Materials Environmental Impact Statement, and the SRS SNF Environmental Impact Statement. Underwater storage facilities, called disassembly basins, are located in all five of SRS’s reactor areas. These facilities were designed to store spent nuclear fuel and target assemblies discharged from the reactor cores. This storage allowed the nuclear material to cool after being irradiated in the reactors. 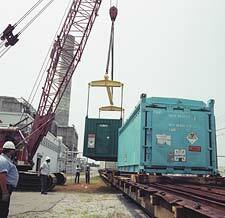 The basins were also used to prepare the nuclear materials for transport to the F and H Areas processing facilities. Only L Basin still contains and receives fuel material. The basins have concrete walls 3 feet thick and hold 3.5 million gallons of water with pool depths of 17 to 30 feet. Although all assemblies are now “cold” enough to no longer require water cooling, water provides shielding to protect workers from radiation. Each basin has four main sections used to receive, prepare, and store the fuel. The fuel assemblies are transferred through these sections via narrow vertical gateways used to isolate the sections. 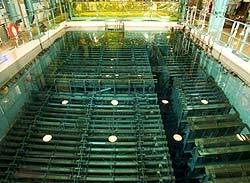 In 1996, the L Basin equipment was reconfigured to safely handle and store spent nuclear fuel (SNF) from off-site (foreign and domestic) research reactors. 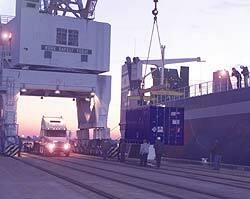 The first off-site fuel was received and stored in February 1997. Inventories include SRS fuel assemblies in addition to the thousands of research reactor spent fuel assemblies received from offsite facilities. Additionally, the basins contain other miscellaneous nuclear materials, some of which will require special handling and disposal. Thousands more assemblies are projected to be received and stored in L Basin in the next decade.